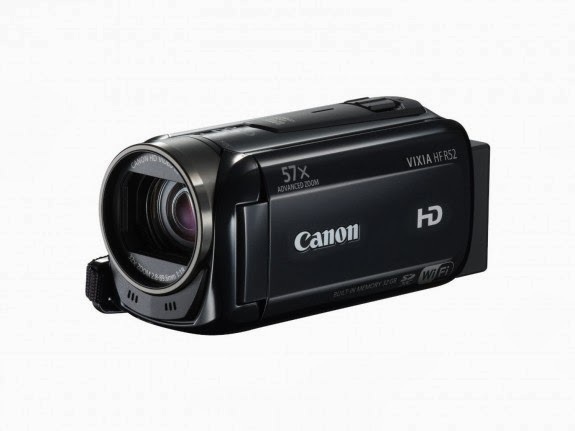 MELVILLE, N.Y., January 6, 2014 – Canon U.S.A., Inc. a leader in digital imaging solutions, has revamped the VIXIA HF R-Series lineup of camcorders with the announcement of three new models, the VIXIA HF R52, VIXIA HF R50 and VIXIA HF R500 camcorders. The new VIXIA HF R-Series camcorders all feature a 57x Advanced Zoom, an upgrade from previous VIXIA R-Series HF camcorders, along with SuperRange Optical Image Stabilization, a Canon 3.28 Megapixel Full HD CMOS Image Sensor, and three-inch capacitive touch panel LCD. The VIXIA HF R52 and VIXIA HF R50 camcorder models feature advanced Wi-Fi capabilities as compared to their predecessor models, enabling them to also function as remote monitoring devices at home or outside the home with mobile internet access. 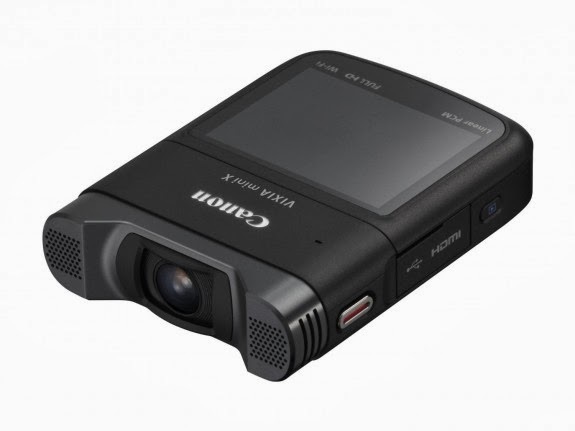 12x Optical Zoom helps ensure outstanding optical performance and versatility. Built-in Wi-Fi® allows wireless transferring of images and video to compatible mobile devices, select social networking sites and your Wi-Fi® enabled computer, and lets you remotely shoot using your smartphone or tablet. 16.0 Megapixel High-Sensitivity CMOS sensor with the DIGIC 4+ Image Processor creates the Canon HS SYSTEM, which helps provide excellent low-light performance. Creative Shot mode uses composition, color and lighting from your original image to create unique images with an artistic flair. Smart AUTO intelligently selects the proper camera settings based on 32 predefined shooting situations. Canon 3.28 Megapixel Full HD CMOS Image Sensor. 57x Advanced Zoom and SuperRange Optical Image Stabilizer helps provide outstanding, steady video. DIGIC DV 4 Image Processor captures video at 1920 x 1080 resolution and helps provide exceptional imaging performance. Record Full HD video directly to a removable SD memory card. 1080/60p recording in MP4 (35 Mbps) and AVCHD Progressive (28 Mbps) for high quality capture of moving subjects. Record up to 12 hours of video to a 32GB internal flash drive or directly to a removable SD memory card. Three new Canon VIXIA HF R-Series camcorders, the VIXIA HF R52, VIXIA HF R50 and VIXIA HF R500 all feature outstanding image quality powered with a Canon 3.28 Megapixel Full HD CMOS Image Sensor, and the DIGIC DV4 Image processor, providing shooters with the ability to capture vibrant 1920 x 1080 resolution Full HD video. Together with the improved 57x Advanced Zoom and SuperRange Optical Image Stabilization, shooters can capture different types of action, like a day in the park, or on vacation sightseeing. The VIXIA HF R-Series also features Intelligent IS, which automatically chooses from four different modes to help provide the optimal image stabilizations based off of certain shooting conditions. From their child’s first steps to the championship soccer game, the new VIXIA HF R-Series camcorders continue to offer users the outstanding image quality and zoom capabilities users have become accustomed to from the VIXIA line. A three-inch capacitive touch panel LCD allows the user to quickly and intuitively switch between settings without affecting their ability to capture their desired images. For enhanced creativity shooters can also customize their video by selecting from seven Cinema Look Filter effects. These filters can be applied during or after filming. Additionally, while in Audio Scene Select mode, users can select from eight predetermined audio modes that will optimize audio settings based off the shooting conditions, including two new ones – meeting and festival. The built-in microphone/headphone terminal provides users with the flexibility to record using an auxiliary microphone, or listen to what they’re recording with headphones. When shooting with the new Canon VIXIA HF R-Series camcorders users have several options for how they would like to store their treasured memories. The VIXIA HF R52 features 32 GB of internal memory, and the VIXIA HF R50 provides 8GB of internal memory – while all VIXIA HF R-series camcorders allow for the user to record to an SD memory card. Shooters can capture crisp, 1080/60p high-quality imagery of moving subjects, such as at a dance recital or school play when recording in either MP4 (35 Mbps) or AVCHD Progressive (28 Mbps). When a shooter chooses to utilize Dual Recording mode, they can record movies simultaneously in both MP4 and AVCHD Progressive, while the built-in down conversion feature creates MP4 files for convenient and easy sharing on the web to popular social networking sites like Facebook or YouTube. Featuring built-in Wi-Fi, the VIXIA HF R52 and VIXIA HF R50 are equipped to add convenience and expand shooting options for filming important moments as well as providing remote monitoring capabilities. Through the free Canon CameraAccess plus** app users can record, zoom in and out, and live stream video on supported Android ™ and iOS® devices. An optional Pan Table base accessory can be attached to the bottom of both the VIXIA HF R52 camcorder and VIXIA HF R50 camcorder, allowing for the camera to act as a baby monitor or security camera. While using the Canon CameraAccess plus app and Pan Table base together users can chose to have the camcorder oscillate left to right up to 200 degrees. The Pan Table can also be manually adjusted for a tilt of up to 20 degrees. And sharing videos of a newborn baby crawling along the living room floor, or a graduate walking across a stage to receive their diploma, with family and friends is easy with the Canon Movie Uploader app*. Free to download, Canon’s Movie Uploader app, available on iOS platform, allows users to send video directly to a compatible smartphone or tablet for instant online sharing. Additionally, Remote Browse***, available on Android devices allows users to preview or download files to a compatible smartphone, tablet, or PC when using a web browser. Once both devices are wirelessly connected, users can download or playback their videos instantly without the need for an application or other software. All three VIXIA HF R-Series camcorders feature Advanced Baby Mode, giving users the ability to select the optimal camcorder settings for capturing a baby’s daily growth. Advanced Baby Mode now gives users the ability to record up to three separate babies, and chronologically save videos into a special Baby Album, seamlessly tracking the growth of each child. The Touch Decoration feature allows users to “stamp” their videos with the baby’s height, weight, and number of days old. Additionally, while using Touch Decoration, users can choose to include their own drawings, captions, and animations. The VIXIA HF R52, VIXIA HF R50 and VIXIA HF R500 camcorders are scheduled to be available in March for an estimated retail price of $449.99, $399.99, and $299.99, respectively. The Pan Table base accessory will be available in March for an estimated retail price of $99.99. Hybrid Viewfinder Coming To Canon EOS-7D Mk II? Canon PowerShot G1 X Mk II Camera Specs? Canon EOS-7D Mk II Camera Finally On Its Way?